THE SKINNY: This is one strange shampoo. It doesn't foam. It feels like you're working a conditioner into your hair. The shampoo is a little oily, not surprising, and has these teeny blue gritty things in it. It doesn't foam. I rinsed it out, and my hair felt squeaky and clean. I really liked the result the first day I used it. My hair was shiny, felt conditioned and had some natural texture and curl to it. I hated it the second day, when I left my hair oily and feeling dirty and heavy. Nelson J says this shampoo is supposed to replace your shampoo, conditioner, detangler, shine spray, smoothing serum, color protector and pre-styling lotion. That's a lot of product for my fine hair. It's no wonder my locks felt weighed down. The reality of this shampoo is I don't believe it works because shampoo should be foamy and soapy. KEEP OR TOSS: Toss. One bad hair day as a result of this shampoo is enough for me. 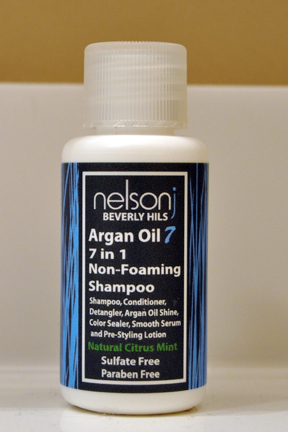 CHECK IT OUT: Nelson J says this shampoo won't strip your hair of its natural oils.